Here’s the state profile for Washington. To review the entire profile, open the PDF that is attached to this post. If you have corrections or additions, please leave them in the comments section of this post. We’ll be reviewing the comments regularly and doing fact-checks. The information you give us will also help us determine how to organize and expand the information in the state profiles. We will be turning this post into a living profile that, with your help and input, we’ll keep updating over time. If you have ideas about other categories we should add, please let us know. And we’ll also make sure that we keep you informed about updates. 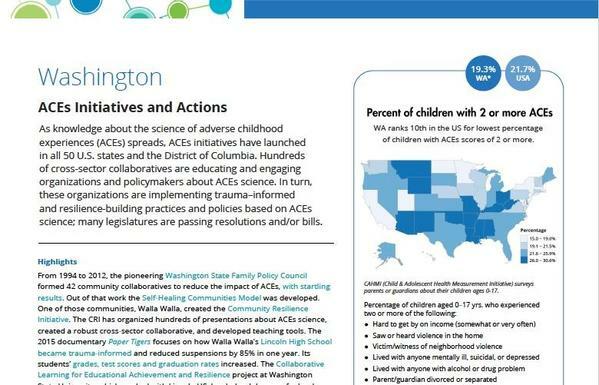 Can anyone tell me how to join the ACES Action Community in the South King County or Federal Way Area? Tory Henderson suggested, I join this committee. I followed up with a private message to Alfred White. My my name is Alfred White, i am a LMHCA & CDP, who has a private practice in the Greater Seattle Area. I would like to become fully involved in ACE as a presenter, group facilitator and a therapeutic clinician referral. DOH funds one ACEs Consultant. Clarification: The ACEs Public Private Initiative (RCW 70.305.005) ended at the end of 2017. The legislation is still in place, but the initiative has ended. The 2018 update to the legislative was that the Department of Early Learning no longer exists. It will be part of the new Department of Children, Youth and Families beginning July 1, 2018.